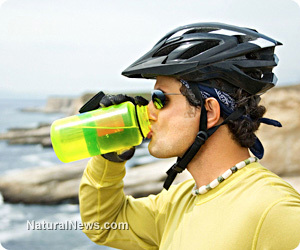 (NaturalNews) Bisphenol A (BPA) is one of those modern toxins that is difficult to dodge. Found in an assortment of plastic food packaging, drink containers and even credit card receipts, it's impossible to completely avoid. And the general public is poisoned by BPA on a daily basis, completely unaware a powerful contaminant is lurking in their food. Yet, health risks can be reduced with basic lifestyle adjustments along with simple detoxification practices. Try for a day to avoid plastic and it will soon become clear it's extremely impractical. A hallmark of modern progress, it's the go-to material of choice in a wide variety of applications. The trouble is that plastic frequently contains BPA, a highly toxic substance linked with numerous disturbing health issues like obesity and diabetes, cancer and behavioral disorders. As a potent endocrine disruptor, BPA has been shown to induce insulin resistance. A study at the University of Cincinnati found even low doses of BPA suppressed "the release of a key adipokine that protects humans from metabolic syndrome." It also alters the mammary glands in fetal mice when the pregnant mother is exposed. This leads researchers to believe it could cause breast as well as prostate cancer in humans. The brain is affected by BPA too. Research published in Neurotoxicology discovered an association between behavioral disorders and the toxin. Women participating in the study had their BPA levels measured during the third trimester of pregnancy. A follow up seven to nine years later revealed a strong correlation between elevated maternal BPA levels and pronounced behavioral dysfunction in their children -- including lower social awareness, cognition and communication. Considering the serious health implications of bisphenol A, it's understandable we want to minimize risk. Food packaging is our number one source of BPA exposure. It cannot be stressed enough: Consume a fresh food diet and avoid packaged foods as much as possible. The Breast Cancer Fund and Silent Spring Institute conducted a study which showed a dramatic drop in BPA levels when certain guidelines were followed. During the week-long investigation, families were given freshly prepared organic meals which did not come in contact with any form of bisphenol A. After three days, the participants BPA levels dropped an average of 60 percent with some as high as 75 percent. - Switch to stainless steel and glass food storage and beverage containers. - Move foods to ceramic or glass food containers. - Consider a French press for coffee - home coffee makers may have polycarbonate-based water tanks and phthalate-based tubing. - Eat out less, especially at restaurants that do not use fresh ingredients. - Limit canned food consumption. - Choose fresh fruits and vegetables when possible. - Soak dried beans for cooking (you can make extra and freeze them). Also, avoid plastic cookware and utensils. Washing your hands after handling money and credit card receipts is helpful as well. Remember, detoxification is essential too. Recommendations include CEASE therapy through a certified homeopathic practitioner, infrared saunas and the herb turmeric. A few changes are all that is necessary to dramatically reduce BPA in the body. And the payoff is considerable -- safeguarding our family, health and vitality while preserving well-being in the middle of a toxic world.